Remember that time, early in your career, when you received an award? That feeling of happy pride when your name was called in front of your peers? When you were recognized for something special, when you felt that tingle of luckiness? A bit like you, Dr Lisa Monkman also remembers receiving an award. The one she vividly remembers receiving was as an undergraduate medical student at the University of Manitoba in Winnipeg. Maybe a little differently from you, however, what she remembers most clearly was not the flush of pride or the tingle of happiness. Dr Monkman is some ways out of medical school now. She’s won many more awards. The event is long since behind her. When she’s not driving up to work in the small First Nations community of Brokenhead, Man, she practises team-based, Indigenous-informed, not-fee-for-service medicine in downtown Winnipeg; she was a founding member of the Indigenous Physicians Association of Canada and is now a Director on the Indigenous Physicians Association of Canada Board of Directors. She balances all of this alongside being a mother and a member of the University of Manitoba Faculty of Medicine. 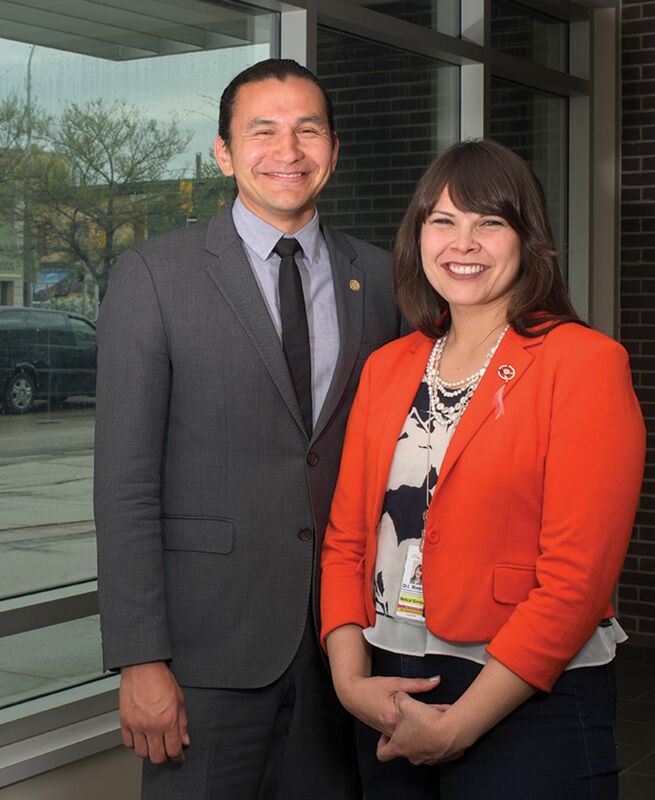 Her husband, already a member of the Legislative Assembly of Manitoba as well as being an icon in Canadian literature and journalism, just announced he is seeking leadership of the Manitoba NDP: it’s a decision Wab Kinew associates closely with his marriage and life partnership with Dr Monkman. 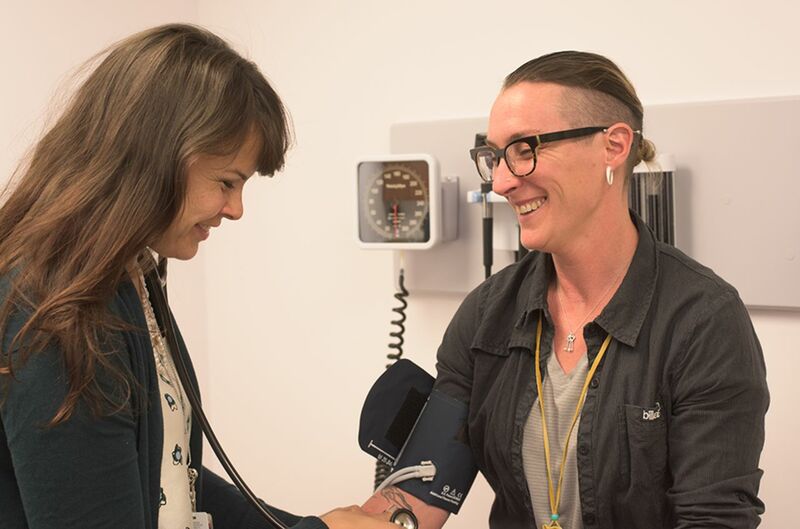 Lisa, in other words, is a high-achieving family physician enacting change at almost every imaginable scale, from her family to her clinical practices, from her patients and their communities to the province of Manitoba and the country as a whole. Still, the circumstances of receiving that award all those years ago, right alongside growing up Anishinaabe with 6 younger siblings in inner-city Winnipeg and a mother fighting to complete an undergraduate degree while keeping food on the table, continue to inform almost everything she does. It’s a haunting question, that question about how and why Indigenous physicians, or Indigenous peoples more broadly, are imagined and confined in the minds of so many non-Indigenous settler Canadians. PHOTO Dr Lisa May Monkman at work in a professional setting. PHOTOS LEFT (Bottom) Dr Monkman and her husband, politician and writer Wab Kinew. (Top) Checkups with patients Stephanie Pollok and (centre) Dr Melinda Fowler at the Brokenhead Health Centre. 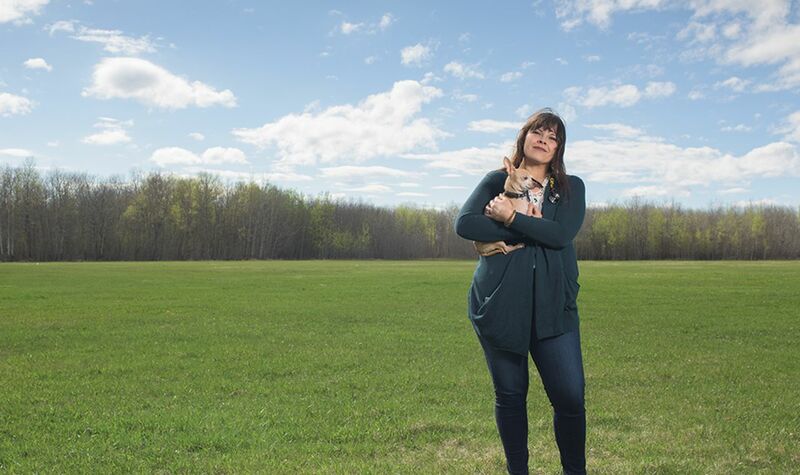 PHOTO RIGHT Dr Monkman on a stroll with her little dog, Guapo, in Brokenhead Ojibway Nation, where she has her clinic. La traduction en français de cet article se trouve à www.cfp.ca dans la table des matières du numéro de juin 2017 à la page e324. Dr Monkman is an Anishinaabe family physician with experience in both rural and urban settings. She currently works at the ACCESS Downtown medical clinic where she provides primary care to Winnipeg’s inner-city residents and homeless population. 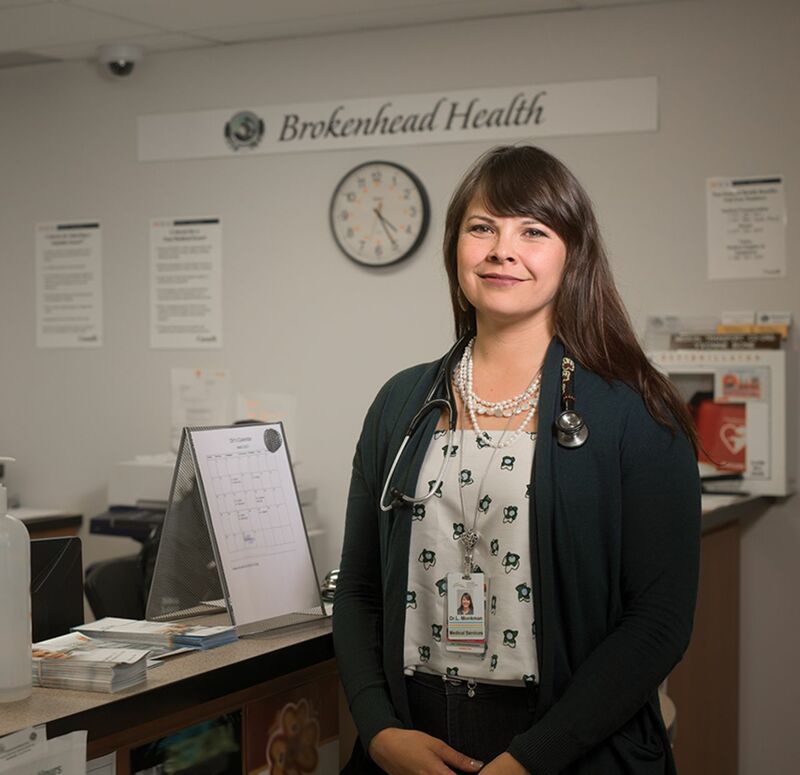 She recently founded an outreach clinic in Swan River, Man, with a focus on addiction medicine in response to local outbreaks of HIV and hepatitis C infections as a result of intravenous drug use. She is currently traveling once a week to Brokenhead Ojibway Nation to establish a medical clinic in partnership with the Northern Medical Unit and Brokenhead Ojibway Nation community members. She is a founding board member of the Indigenous Physicians Association of Canada and spends her free time pursuing health and wellness in many different forms. She is a certified yoga instructor and former member of the Nay-a-No and Neebin Noodin drum groups. She currently volunteers much of her time with several different advisory boards. She works with Returning to Spirit, an organization that seeks to heal the wounds of residential schools; the Mercury Disability Management Board; the organizing committee for the 5th, 6th, and 7th International Meetings on Indigenous Child Health; and the Indigenous health advisory committee to the Canadian Paediatric Society. 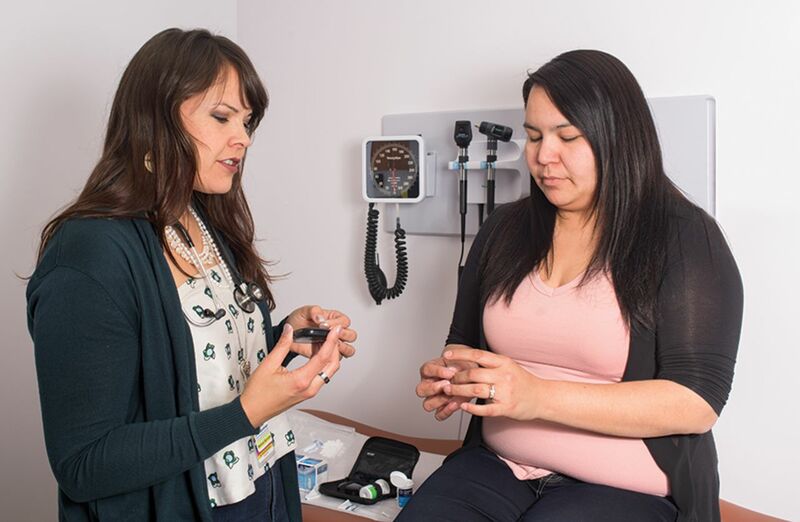 Dr Monkman hopes to one day further her education in pursuit of a master’s degree in public health and remains committed to serving the Indigenous community in Manitoba.